(Helianthus annuus) Although the name 'sunflower' is sometimes used to refer to all member of the genus Helianthus, many of which are perennials, it most commonly refers to Helianthus annuus, an annual plant. The name 'helianthus' is Greek for 'sunflower'. The 'flower' of Helianthus annuus is actually a head, composed of many flowers crowded together. The sterile flowers on the outer margin are ray florets. They can be many different colors - yellow, orange, maroon, and so on. The flowers at the center of the head are the disc florets, which mature into seeds. Sunflowers are native to the Americas. They were grown domestically as early as 3000 B.C.E. in Arizona and New Mexico. Some archaeologists think the sunflower may have been domesticated even before corn. Incas used the sunflower as an image of their sun god. Both the flower and seed were cast in gold and were taken back to Europe early in the 16th century. The plant was grown as a popular ornamental through the 18th century. An English patent was granted for pressing oil from sunflower seeds by 1716, and sunflowers were cultivated for oil production by 1769. Russian farmers grew over two million acres of sunflowers by the early 19th century, and successful research programs had increased yield and oil content significantly. U.S. seed companies advertised the 'Mammoth Russian' sunflower seed in their catalogues by 1880. Sunflower leaves are phototropic; they turn slowly to follow the sun's rays. This increases light interception, and it may also increase photosynthesis. Buds are also heliotropic, and on sunny days they turn from east to west, returning to an east-facing position at dawn. The motion is created by special cells in a flexible segment of the stem just below the bud. The stem stiffens as the plant matures, and when it blooms, the stem freezes facing eastward. The stems and leaves of Sunflowers have a rough, prickly surface. The bristles discourage plant-eating animals. They also conserve water by limiting evaporation. Sunflowers need full sun to grow well. They prefer fertile, moist, well-drained soil with a lot of organic matter dug in. They tolerate a wide range of soil types, from sands to clays. They are not very tolerant of salty soil. Sunflowers have a strong taproot and show a prolific lateral spread of surface roots. 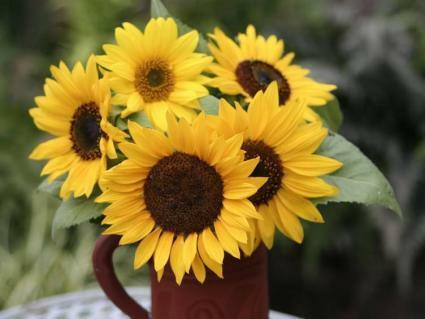 Seventy to 78°F is the best temperature range for growing, although sunflowers are not particularly fussy. They are not sensitive to daylength. Sunflowers are wonderful plants to grow with children. The seeds are large enough to handle easily, and they germinate in about 11 days. They can easily be started on a windowsill in the spring, or they can be sown directly in the garden. Seeds germinate most readily at 46 to 50°F, and both seeds and seedlings can tolerate some frost. Seeds should be planted 2 to 3 inches deep in light soil, as shallow as 1 inch in heavy soil. kept evenly moist. The critical period for water is about 20 days before and after flowering, when the plants should not be stressed. 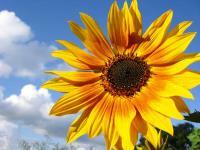 Sunflowers bloom about 70 days after sowing and are mature in 80 to 90 days. Bees and other insects are necessary for pollination. As the seeds ripen, birds will steal them. If you want to keep the harvest, you can cover the flowerheads with cheesecloth or some other protection that will allow light and air to penetrate. The flower heads turn down, the florets in the center shrivel, and the back of the flowerhead changes color when the plant is mature. Cut the seed head with ten or twelve inches of the stem attached. Hang it in a warm, dry, well-ventilated area to dry. When the seeds have dried, they can easily be rubbed from the heads. Sunflowers are beautiful ornamental flowers in an annual bed or a mixed border. They are a good choice for butterfly gardens; monarch butterflies are especially attracted to sunflowers. Commercially, sunflowers have many uses. Sunflower seeds are eaten as snacks, included in salads, and roasted. Seeds are also used as bird feed. 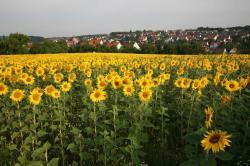 Sunflower oil is a popular cooking oil, and the pulp left after pressing can be fed to livestock. One of the best species in the whole genus as a background to mixed borders, or as a feature in open shrubberies. It forms large, bushy plants 4 to 6 feet in height, with strong, much branched stems, rough on the upper half and usually quite smooth on the lower. A very tall, elegant plant. The stems often exceed 10 to 12 feet high, the leaves narrow, tapering to both ends; the flowers deep yellow, 2 to 3 inches in diameter. It is one of the latest to flower, and has been found variable under cultivation, giving rise to several garden names. Moist ground. N. America. It is so very distinct from all the other species so well known in gardens, and such a good all-round plant, that it well deserves a place. It rarely exceeds 3 to 5 feet in height, producing numerous large fine rich yellow flowers, remaining a considerable time in good form. The var. maximus has larger flowers with more pointed rays, and the varieties plenus and Soleil dOr are both very desirable double-flowered forms. From the garden standpoint, the varieties of H. multiflorus rank high, and should be grown by all. Though a small-flowered plant, is yet one of the best for the picturesque garden. It is one of the late-flowering species, and is often damaged by early frosts. It grows from 6 to 10 feet high, having numerous linear leaves and bunches of deep golden-yellow flowers. It is a native of dry plains of Nebraska and Texas. (Helianthus Rigidus) - This distinct, though variable, species is perhaps the best known of all the Perennial Sunflowers. It grows from 4 to 5 feet in height, with a rough stem, the upper leaves always alternate, distinctly three-nerved and veined. The flowers, bright yellow and very showy, are produced very freely. It is a native of the plains and prairies of Georgia and Texas. H. r. Miss Mellish is one of the best varieties. A giant among perennial kinds, and a late-flowering sort to boot. Flowers golden-yellow. October-November. A beautiful and distinct species of bushy habit, having silvery downy foliage. The golden-orange flowers are produced freely in September. Height, 4 feet. A very slender species, rarely more than a couple of feet in height, with lance-shaped leaves and yellow flowers, about 2 inches in diameter. N. California. A fine kind rarely seen in gardens, though from its neat habit and profusion of flowers it should be a welcome addition to the mixed border. It grows about a yard high, loosely branched, the stem as well as the leaves being covered with stiff hairs; flowers yellow, 3 to 4 inches in diameter. The variety canescens is covered with white pubescence. Texas. A very distinct plant with large deep yellow flowers, stout branching stems, and broad, oval, coarsely-toothed leaves. California.